It’s 6:50 am, there’s not a cloud in the sky, the sun’s just making an appearance on the horizon and it’s already 24 degrees Celsius (about 75 degrees Fahrenheit). As I gently flick my rod tip, looking down into the crystal clear water at the marina, I can clearly see my 2” pink Power Shirasu, which is rigged on a size 10 1.4g jig-head hopping and dancing its way across the rocks and boulders which sit in around five feet of water. Without warning, a Madeira Rockfish shoots out from his rocky lair, opens his mouth and inhales my lure. He tries to turn and get back into the sanctuary of his home with his latest snack, but he’s too late. I’ve seen him ambush the lure and react quickly enough to stop him. A few turns of the reel handle and I swing the Rockfish to hand, paying particular attention to his venomous dorsal fin. I quickly unhook him, take a photograph, slip him back and watch as he swims away. I don’t feel for bites here, I watch everything unfold before my very eyes. This is sight fishing LRF (Light Rock Fishing) style at its best. Welcome to the island of Tenerife. Tenerife is the largest of Spain’s Canary Islands, which lie off the coast of West Africa. The island, which sits in the Atlantic Ocean, attracts around 5 million visitors each year who head there for its all year round sunny climate. 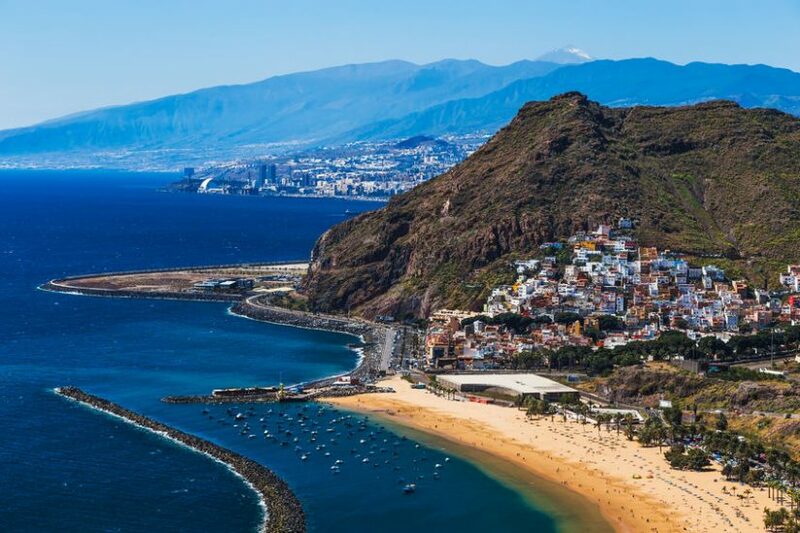 Apart from year-round sunshine, the holidaymaker is also drawn to Tenerife for its world-class golf courses, shopping centres, beaches and nightlife. Other than tourism, fishing makes up a large part of Tenerife’s economy. Just stand on the quay and wait for the fishing boats to return with their catch and you’ll see how rich these waters are. Almost every restaurant on the island offers fresh fish daily. If you plan on fishing whilst you’re in Tenerife, you can either take a trip on a charter boat or simply go it alone. There are many fishing charter boats available around the island, where you can book anything from a couple of hours reef fishing where you’ll look to catch Snapper, Grouper and Barracuda, or up to eight hours deep sea fishing trips where you’ll do battle with species like Marlin, Tuna and Wahoo. Although I have taken such trips before, I’m far more at home wandering around the marina, peering into a rock pool or standing on a rocky outcrop looking out to sea with a light lure rod in my hand fishing for mini species. I find this type of fishing to be underrated but incredibly fun! The first thing you’ll need to consider if you plan on spending a few hours fishing whilst on holiday is what tackle to take. One thing to remember is that you won’t need anything special or sophisticated. 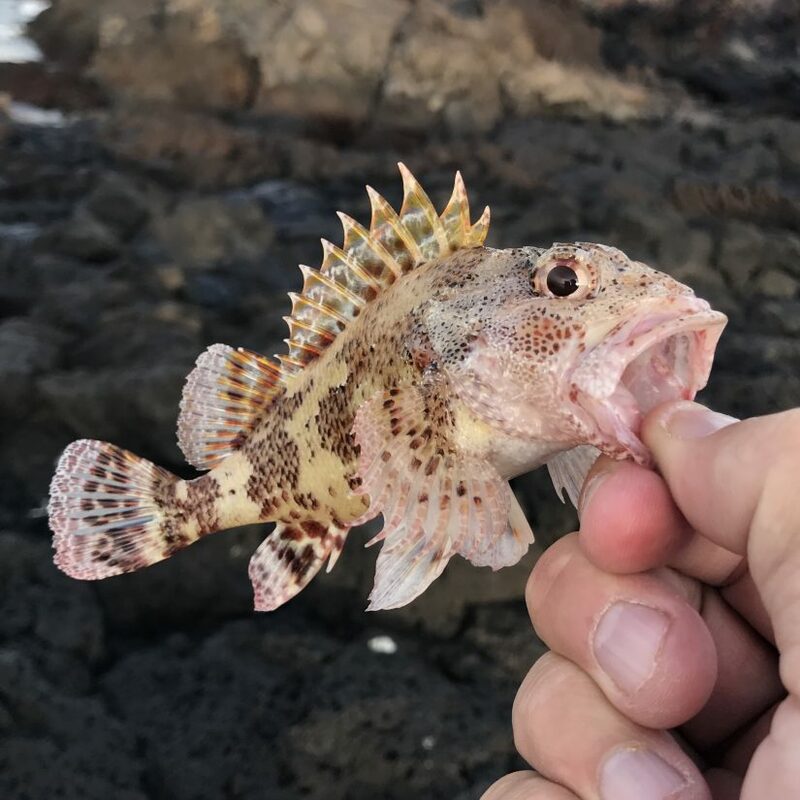 LRF is the same in saltwater in Tenerife as it is in the UK, apart from the fact that you’ll encounter species that you won’t come face to face with here. Simply bring your LRF tackle with you. Your rod, reel, lures, jig heads, hooks etc will be fine to use in Tenerife. Here’s a quick look at what I take with me when I visit the island: a four-piece Savage Gear Roadrunner XLNT2 7’ 3-16g rod, on which I use a Shimano Nexave 3000 spinning reel. I don’t bother using braid or fluorocarbon on this reel, I simply use 4lb mono straight through. I like a small tackle box holding a few split shots, some small hooks, various jig heads ranging from 0.6g through to 2.3g and a good assortment of lures in the one to two-inch range in an assortment of colours. I personally like the Ecogear Pocket In boxes as they come with various lures and an assortment of jigheads. I’ve found green, pink, silver and red lures to be most productive. 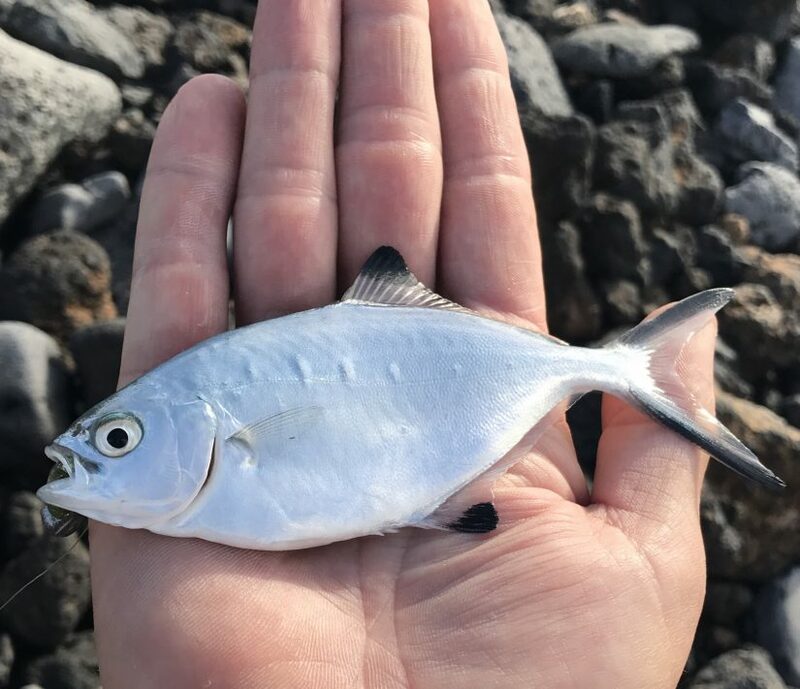 Anyway, having just returned from a trip to Tenerife, I’m wanted to share my experiences of a very productive morning’s fishing from different locations on this extraordinary island. This particular morning I decided to start fishing down at the local marina. I arrived at the start of the marina and peering down the first thing I noticed was the water clarity. Even in eight feet of water, I could see everything that was going on. I spent a couple of minutes just looking into the water. I could see a group of Ornate Wrasse casually cruising up and down, just above the rocks and boulders which make up the bottom. A few dark coloured fish caught my eye, which looked like Blue Fin Damsels. A Pufferfish made an appearance along with a group of small silver fish, maybe Mullet although I wasn’t 100% sure if they were. Time to get a bait in the water and see what happens. With there being no current in the marina and no urgency to get the bait down, I opted to start with a size 10 1.4g Shirasu jighead, on which I mounted a 2” Power Shirasu lure in a pink glow. A simple underarm flick saw my lure land around 10 yards away, about 4 feet from the marina wall. I wanted to work this bait on and just off the bottom, so I watched it slowly sink through the water column, the little pink Shirasu working away as it sank. Before it was even halfway through its descent, a group of Wrasse appeared from nowhere. Without hesitation, one of the fish grabbed hold of the little lure and moved off quickly with his snack, afraid that the others would want a piece of it. No need to really strike as such, a gentle lifting of the rod was sufficient to set the hook. The rest of the group seemed oblivious to the thrashing fish next to them. 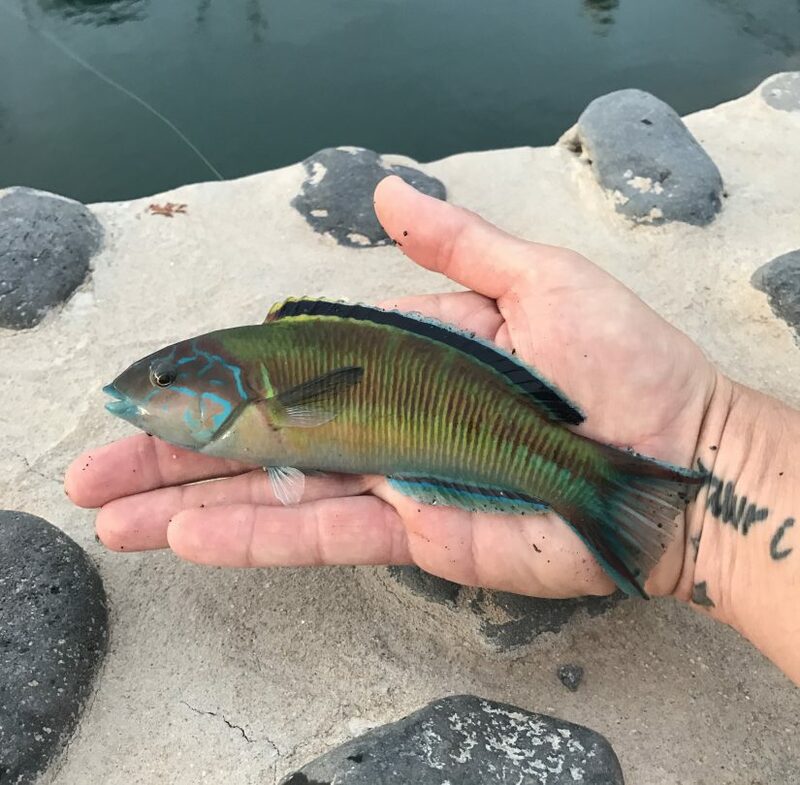 After a few seconds, I lifted the little Ornate Wrasse out and swung him to hand. At around 5”, not a big fish by any standards, but this is what light rock fishing is all about. After I had quickly unhooked him I slipped him back and watched him rejoin the group. A second cast saw the same thing happen. On its descent, the lure was snaffled by another hungry Wrasse. Slightly smaller this time, but just as welcome. These Wrasses didn’t seem finicky at all – they were just hitting the lure on the way down. I noticed that if the lure finally made it to the bottom, several Wrasse would just hover above it, looking and waiting. The second I put any movement into the little Shirasu, it was gone. I caught around ten Wrasse in the first twenty minutes. It was great fun, but it was like hitting a shoal of Roach. I just couldn’t get through them to find anything else. I decided to wander a little further, peering into the water every few yards to see if I could spot any fish and look at the make-up of the bottom. After around 100 yards or so, I came across another promising spot. Similar to the first, but the water seemed a little shallower here, maybe around the five feet mark. The bottom was made up of some large boulders with lots of smaller rocks and stones. 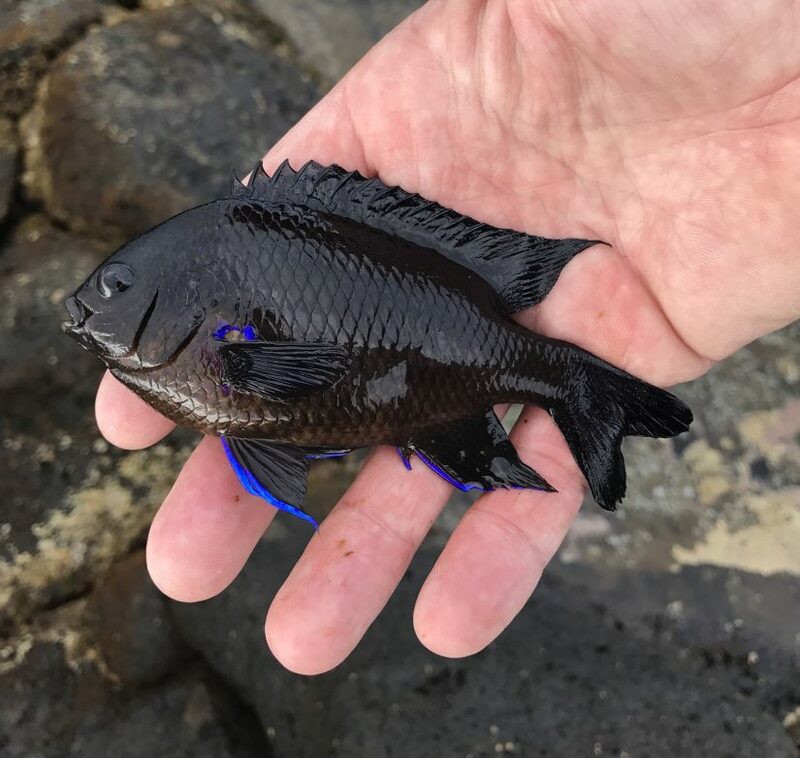 I saw several Blue Finned Damselfish, which are quite prominent in this area, plus a group of really small Ornate Wrasse. I decided to stick with the pink Shirasu for now, it was working well, although I’d seen a couple of them destroyed by the Wrasses’ dentures. I started by casting out along the marina wall and watched the little lure as it made it to the bottom. As I started gently flicking it back, I watched it dance and hop along the bottom. It was soon spotted by a group of small Ornate Wrasse. The largest fish in this group must have been all of 2”, but it didn’t stop them from attacking it. As I brought it past a large boulder, a brown fish appeared from nowhere, opened his mouth and inhaled the little pink lure. Luckily I was paying attention, or else he would have got back under the sanctuary of his rock with my lure and jighead. I quickly lifted my rod, made several turns of my reel handle and swung this little guy in. This was a Madeira Rockfish, common throughout the Eastern Central Atlantic Ocean and the Western Mediterranean. Similar in appearance to our Scorpionfish, they possess a very spiky dorsal fin and have armour around their gill plates. A word of warning: the dorsal fin on these fish is extremely venomous, you must take extreme care when handling them. Lip gripping is by far the safest way to hold them. After slipping him back and watching him swim away, I decided to give this spot another five minutes before heading away from the marina. The pink Shirasu was now badly damaged so another change of lure was in order. After getting through three or four of these baits, I opted to give the Straw Tail Grub in red glow a go, a lure that I’ve never used before. I would fish this in the same way as I did the Shirasu, hopping and bouncing it along the bottom. After several casts of inactivity, I decided that this was my last cast in this spot. Just as I was about to lift the lure out, a fish appeared from under a rock ledge and gulped the grub down. Another Madeira Rockfish, although this time the red variety. After a quick unhooking and photograph, I slipped him back and watched him head back into his rocky lair. It was now time for a change, I wanted to give the open sea a go. A brief walk along the marina to the end followed by a small climb up a gravel embankment saw me arrive on a dusty pathway. After a two minute walk along here, I arrived at a large set of rocks which jut out into the Atlantic Ocean. Being quite flat and several feet above sea level, they offered a good safe platform in which to fish from. The first thing I decided to do was to swap the 1.4g jighead for a larger 2.3g so I could combat the extra water movement better and enable me to get the bait down quicker. I decided to try a small Grass Minnow in green, so I rigged it up and out it went. The sea was relatively calm, which made things a little easier. After a couple of inactive casts, my rod pulled round as a fish took the bait. Another Madeira Rockfish, quite a bit larger than the two I’d caught from the marina, was swung to hand. After several more casts, a lively Ornate Wrasse was hooked that battled all the way. After two more Rockfish and a dozen or so Wrasse, I decided to move as I’d noticed a spot the day before whilst sitting in a restaurant at the top of the beach. Believe it or not, I was going to do a spot of fishing in a rockpool. When I say rockpool, this thing was the size of an Olympic swimming pool. Some parts towards the middle looked to be about three feet deep. As I stood next to it and peered in, it was obvious that this water was alive with fish. A group of seven Damsels swam around together, a large shoal of silver fish was just hovering midwater, Gobies and Blennies could be seen hopping around the rockwork and there were lots of small Wrasse present too. I started with a silver Grass Minnow rigged on a 1.4g jighead. I had to be a bit careful here, it looked pretty snaggy. So I carefully cast out around the 5-yard mark and landed the lure directly on top of a flat rock which was submerged by only a few inches of water. I carefully flicked the lure off the rock and it dropped to the bottom of the rockpool where I immediately started working it back. Almost instantly it was hit. Another Madeira Rockfish, but this time a really dark brown one. The next fish that took a fancy to my lure was a Goby. I watched him follow the Grass Minnow for several feet before deciding to take it. Two more Gobies followed before a Blenny got in on the act. I noticed the Blennies weren’t as aggressive as the Gobies or Rockfish who just engulf your lure. Instead, they would just follow your lure having the odd nibble, and then just turn away. The odd one though nibbled the hook, which was unfortunate for them. I alternated lures between Grass Minnows, Shirasus and Straw Tail Grubs and caught fish on all three lures. I ended here with three Rockfish, six Gobies and two Blennies. Very productive, but now time for a change as I was getting some funny looks from passers-by who must have wondered why somebody was fishing in a rockpool. I’d previously made my mind up to have a go from the beach itself, as I’d seen fish flashing a few yards out from the shoreline on a number of occasions. Not knowing what they were, the only thing to do was to give it a go. I upped the jighead again to a 2.3g and rigged it with a green Grass Minnow. I didn’t want to bounce this along the bottom, I was going to retrieve it through the water column. The wind was very light as I made my first cast. Once the lure hit the water, I engaged the bale arm and started my retrieve. As soon as I made contact with the lure my rod bent round immediately. Whatever it was had hit it on the drop and was fighting quite well. After a few seconds, I swung in a Palometa. Not a massive fish, but certainly the hardest fighting fish of the holiday so far. Four more followed in quick succession, all hitting the lure pretty much on the drop. After several minutes, all went quiet. The shoal had obviously moved on elsewhere. On walking back to my accommodation, I passed a small beach area alongside the marina. I could clearly see a fish several yards out, swimming about in mid-water. Was it worth a quick cast? Yeah, why not. Without hesitation, I rigged up the first lure I got my hands on. It was the ever faithful pink Shirasu. With it rigged on the still tied 2.3g jighead, out it went. After no more than two turns of the reel, I felt a series of nips on the lure. This continued until the lure was almost back at my feet when I noticed bits of pink lure floating up to the surface. I lifted it out and noticed that I was now fishing with a 1/2” pink Shirasu. Whatever it was had literally nipped the lure all the way back. My now 1/2” pink Shirasu went out again and I hoped that whatever was nipping it was still there. Sure enough, I felt a nip again. Unfortunately for the fish, he nipped once too often, as the next nip he took was the remaining bit of lure that was attached to the bend of the hook. As I swung the fish towards me, I could clearly see the unmistakable shape of a Pufferfish. This guy wasn’t happy at all. He started croaking at me and by the time I’d managed to remove the hook, my 5” Sharpnose Puffer had turned into a tennis ball. I popped him back and watched him float about for a minute or so before he deflated and returned to his home. That was well worth another five minutes. I found this to be a typical morning’s fishing LRF style in Tenerife. During the course of the holiday, I caught approximately 80 fish, all falling to lures apart from three Damsels that would only take bread. I caught fish from the marina, out at sea from the rocks, off the beach and even in a rockpool. The beauty of fishing in a place like Tenerife is that you just don’t know what you’ll catch. Next time you’re planning on a trip over there, slip a little bit of LRF tackle into your suitcase, it’s certainly worth it. Don’t forget that you also need a license to fish from the shore or boat not only in Tenerife but the whole of the Canary Islands as well as mainland Spain. I strongly advise that you purchase one before you travel online, as purchasing them when you are there can be a bit of a headache. Well, that’s it for my little fishing holiday adventure on the beautiful island of Tenerife. Hope you enjoyed it and tight lines till the next time! 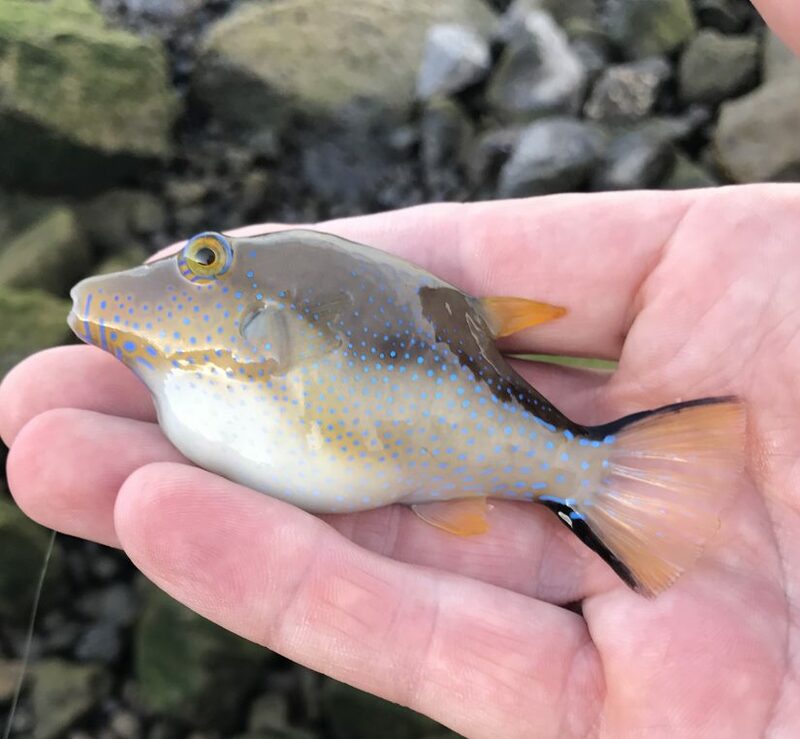 This entry was posted in Fish Species, Fishing Locations, Saltwater Fishing on November 11, 2018 by Damion Fryer. Fishing and golf? That’s it. I’m sold! Looks like a great vacation spot with plenty to do. I could probably even convince my wife to tag along on this one. Hi Max. From what the post’s author, Damion, tells me, you really cannot be bored on Tenerife. Also, though he fished from shore for small species, the offshore fishing on the island for big game fish is world-class.